We’re busy! 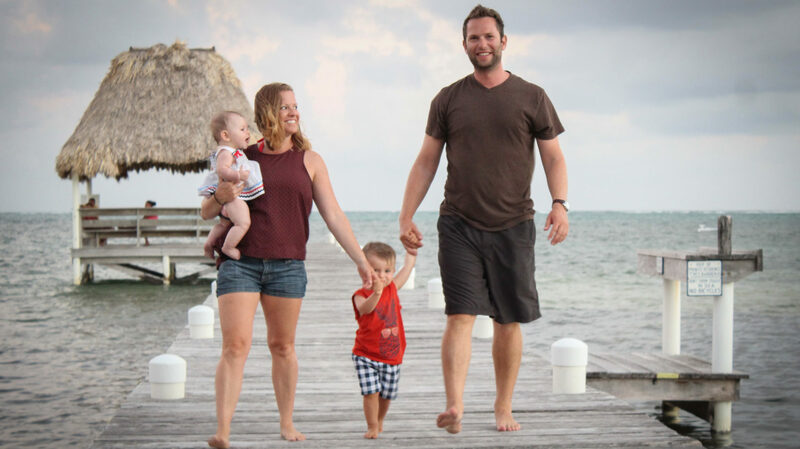 We both work full time jobs, we’re raising two young children, we’re rehabbing an old home from the late 1800s… and we’re trying to find time for as many memory-making adventures as possible! Between laundry, dishes, keeping our fridge stocked with healthy food (and convincing our toddler to eat it), picking up after our toddler, trying to keep the baby from crying, fixing things around the house, taxes, work… I’m sure you know the feeling… we’re constantly looking for ways to make our life easier. When we’re home life is hectic and traveling with two kids is no ‘piece of cake’, but that feeling you get when you’re out making memories on family adventures makes it all worth it. The plan is to share some of our adventures and learnings with you here. Hopefully, you can find something that makes your next adventure easier to attain… and we’d love to hear if you have any tips for us too! We met on a plane (ironic right? ), both traveling for work, which I haven’t done since, on a quick 85 minute flight. I remember BJ wanted a new dog (I tried to give him a stray pitbull later that week which I ended up keeping, he eventually ‘adopted’ and we still have), lived about 6 blocks from me and kept me talking with the current edition of SkyMall. Seven weeks later we were on our first trip together! Our first born went on 6 trips before his first birthday, and we’re hoping to beat that with our second (she’s gone on 3 trips)! When we first met, I usually didn’t use all of my 3 weeks of vacation per year and never really sought out any sort of travel. Well, that’s changed 🙂 In addition to being my source of comedy, moral compass, and general counsel, Jessica is also my local vacation inventor. She spends many nights in bed on her phone searching for our next travel destination. If she’s not looking up travel, she usually is planning the next home project that I’ll be working on. Oh yeah, the normal stuff: she’s a computer engineer who works from home for a Fortune 500 company. She’s good at what she does but dreams of a full time travel schedule. BJ is a money-saving DIYer, an engineer by nature (and profession) and a father of 2 children and 1 pit bull. He vowed to his wife on their wedding day that he’d ‘fly beside her wherever she wanted to go’. His idea of a perfect day starts at 11 am and includes sailing with his family and kiteboarding in crystal clear water. We are busy just like everyone else. We are worried that the days of rushing to work, hurrying back home, aiming to complete household chores, trying to keep ourselves happy, and not going crazy all the while will reduce the number of family memories that we can make. One day we are going to turn around and the kids will be 10, 20 or older and we are going to wonder where the time has gone. That will happen no matter what. Our goal is that when those moments happen we will have a massive amount of happy memories, terabytes of travel videos and photos, and friends from around the world. Jessica and I work “normal” jobs. Well, mine is more normal than hers. In short, I am a manufacturing engineer for a big company. My workplace has a pretty good culture, however a common answer to “how are you today?” is “living the dream” said in a sarcastic manner. My goal is to find a way to have the same answer minus the sarcasm! Jessica works from home. We always have a nanny or a parent come for childcare, but Jessica works on many many tasks throughout the day. A 5 minute break from work for her might be to update the nanny taxes spreadsheet, clean something that she’s been looking at all day, help with the kids when they decide to both be a handful at the same time, update the grocery delivery order (we use Green Bean), drop packages off at UPS or Fedex, and the list goes on. While traveling more often will require even more work, the memories we get in return will be worth it. We would love to write about travel exclusively, but we just don’t travel enough yet to make that a reality. We travel more often and to more unique destinations than any co-worker or friend. But, compared to any of the full time traveling families we pale in comparison. That is something that we want to work on! As a result, we also write on other passions of ours. I am confident even if we were traveling full time that we would be writing about how we constructed or planted something. DIY and gardening are passions of ours that I expect will shine through no matter what our schedule or location will be. We admire and seek to emulate our travel idols outlined on the Inspiration page. We would love to hear feedback on individual posts, the entire website or even our blogging strategy. Even more importantly, we look forward to hearing how our blog has inspired you, taught you, changed you, or how much you dislike it. The best way to work towards being similar to those we admire is to hear from you on how we are doing. We haven’t found the blog, group or family that we want to be exactly like. We hope to use the tips and tricks from our role models to help us squeeze the most out of life.